The position is great. The views are spectacular. The accommodation includes 3 bedrooms, ensuite, full bathroom and powder room and 2 living areas. The kitchen is serviced by stainless steel appliances, granite bench tops and glass splashbacks. The main bedroom has an ensuite, a balcony and extra large walk in robe. The additional bedrooms have built in robes and access to a further balcony. Also downstairs is a full bathroom plus a family room, laundry and internal access to the double garage with remote. I require a security deposit of $800 paid into my cheque account which is fully refundable if the property is left in a clean and tidy condition ( as found). Wonderful place to stay, so spacious and well appointed. Great location right on the beach! The outside shower was a bonus when coming back from multiple swims per day. Great location to base out of to do the traditional mogo town and zoo, batemans bay attractions and all the other south coast activities. People in the area nice too. My lads and I had a ball, thanks for letting this property to me. We had a fantastic time at Valerie’s house. The property itself is neat, spacious and light-filled making for a comfortable stay with air-con, a well equipped kitchen and three bathrooms. 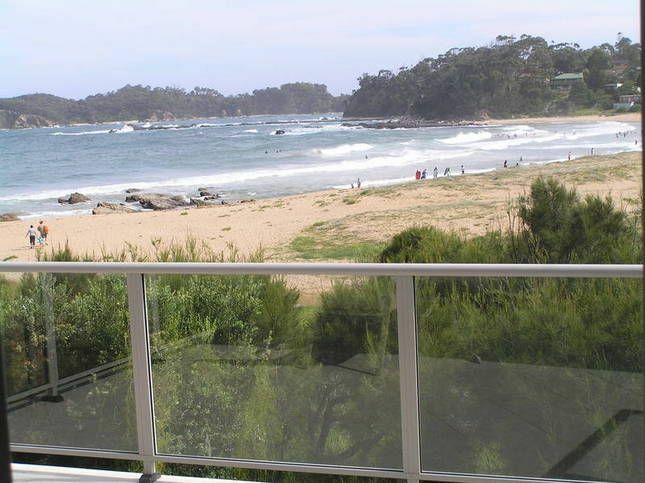 Views of the beach and headland off the back deck are spectacular with easy access to the beach via a walking track. Close proximity to shops and cafes. We were sad to leave, but very happy we found this hidden gem. Thank you Valerie! Glad you enjoyed your stay at my beachfront property. You are most welcome to come again. We had a lovely stay. The close proximity to the beach was fantastic & the 2 bathrooms plus 3rd toilet worked really well for our family of 5! The property could easily accommodate a few more. The owner was a pleasure to deal with, with the security deposit returned promptly. Info re garbage collection & expectations would be a valuable addition, although the owner is readily available if you have questions. No linen is provided, so take tea towels, bath mats, hand towels plus towels & bed linen. Enjoy!!! The house & views were amazing. The house provided everything you could wish for and also was presented in prestige condition. We will return!